Mate Danny might have white crabs. (He's fishing as I write.) Usually Does -- Bad Winter. The boat provides green crabs. Reservation staff hardly know what species we're after, let alone whether there will be a certain kind of bait. Reservation Staff, however, are the only way to secure a spot. I may not check email all day - they're manning phones 24/7..
Danny Might Have White Crabs -- Boat Provides Greens Only. 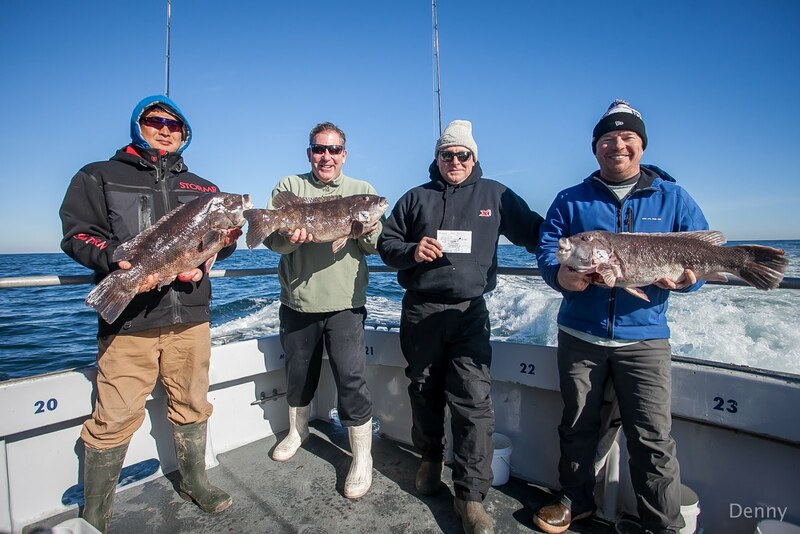 Tog Fishing Friday, 1/26/18 - Long Tog - 6:30AM to 4PM- $125.00 - 16 Sells Out. Tog Fishing Saturday, 1/27/18 - 6:30 to 3:30 - $125.00 - 14 Sells Out. Reservations Required at 410 520 2076 Open 24/7 - On My Rig You Can Reserve What Spot You're In. Please See http://morningstarfishing.com For How The Rail's Laid Out..
Had four trips in a row - watched the bite taper as south-bound currents carried colder & colder water from the north across across our reefs. Whales .. Seeing whales in, for us, large number. That means sometimes zero/sometimes 6 a day.. Cold pushing them south. Maybe cod too soon? Was at a recent sea bass meeting when the presenter told how important calculating "recreational release mortality" was in determining allowable recreational catch. Pretty good crowd, I told everyone how I'd studied release mortality since before regulation began; how in later years (right after the 2009 'emergency' sea bass closure) we'd taken trips with MAFMC & MD DNR Fisheries aboard to study recreational release mortality. The concern is 'barotrauma' - when you see the stomach bulged out & eyes a bit too. Ain't much use throwing fish back if they die. We were taught -- Everyone was taught -- "They All Die" in the 1970s & 80s. As a young deckhand I was told there was absolutely no use in throwing any fish back. Yet in the first year of sea bass size limit self-regulation (5 yrs before fed/state regs began) we were seeing hook wounds, sometimes multiple hook wounds, in sea bass at heavily fished reefs. These fish must have been caught, released, and caught again -- even 5 times! Even though they obviously reacclimate gas pressure; still, "They All Die" persisted. So my crew & I began tagging. That's when we learned about habitat fidelity..
..tagging showed us sea bass do just fine with release; that those hook wounds we'd observed had told the truth of mortality -- very low. At about that same time (1996-ish) some scientists on the monitoring committee took their minds off scallops & fluke--or some other 'important' species--and drew 25% from thin air as the "Recreational Discard Mortality" for sea bass. And, with 25% as our dead-discard rate -- in 6 years (by 2003) sea bass were at their highest population ever off DelMarVa. Would that fisheries were in a better place with knowledge today. When NOAA's 2009 'emergency' sea bass closure occurred I was fighting obviously bad estimates hard, &, as an aside, the 25% mortality assignation..
That's when I took fisheries staff - for free mostly - out fishing in 125 feet of water to study release mortality. We'd reel a fish up, and as soon as it broke the surface start a stopwatch. (I'd already been doing this for years.) When the the fish swam down out of sight, the watch was stopped. In 3 days of good sea bass fishing in warm summer water, we could not obviously kill a sea bass from barotrauma. 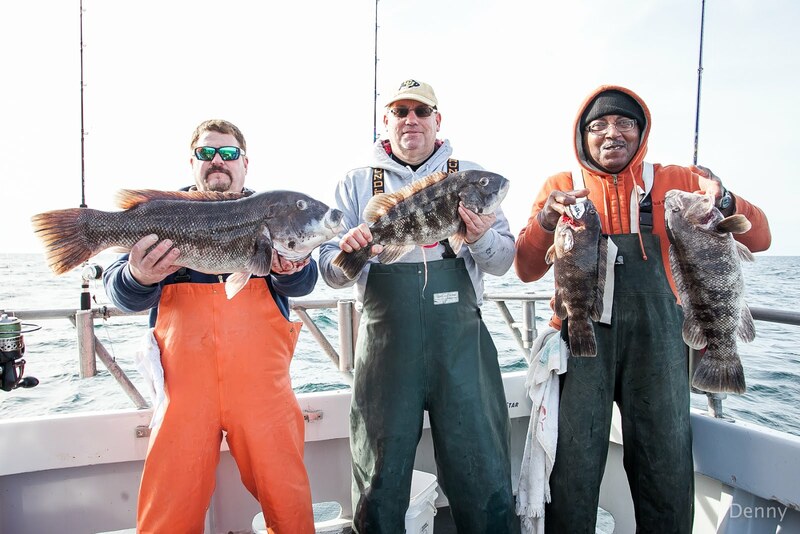 Most sea bass fishing along the coast -- and ESPECIALLY where far higher numbers of discards occur -- is inside 90 feet of water, even much less. In fact, where MRIP shows UNBELIEVABLE CATCHES DESPITE INCREDIBLY STRICT REGULATION, the water is much shallower. Yes, hook selection is important - Kahle (wide gap) & circle hooks work equally well. But even with tiny gag hooks, (J hooks) I doubt mortality would climb as high as presently thought--a percentage we're held accountable for. After those trips with staff aboard the release mortality assigned to rec fishers mysteriously dropped to 15%.. I promise THAT number is also too high. So, during the recent meeting I was told how my observations differ from the "science." That the 15% was a good number, if you will, and that my observations were unique..
What the presenter did not realize was, whether from early in management or much more recently -- when science is absent, they just wing it. Release mortality -- Spawning Biology's Role In Production -- Habitat/Ecology's Role In Populations; or, more accurately perhaps, habitat ABSENCE's role in reduced populations, & warming's role in NEW populations: aside the assertions of long-time fishers, here our true scientific understanding of sea bass is quite near zero. Add to that MRIP's Recreational Catch Estimates with proportions of catch that could not possibly be true - could in no possible way be vaguely accurate - and you begin to understand how a population of fish supposedly managed with 'economic yield' very much in mind can climb to a population far-far-far higher than any had dreamed ..and still "Scientifically Require" quota cuts.